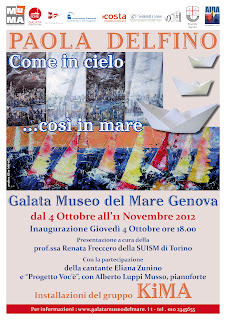 In conjunction with the Genoa Boat Show you can visit the exhibition at MUMA in Genoa "As in Heaven ... so at sea" personal exibit by Paola Delfino. The exhibit includes works of the last 10 years: thirty medium- large pieces and a dozen unedited . The show will be inaugurated on the 4th of October, 2012 at 18:00 at the Art space MUMA Galata Museo del Mare e delle Migrazioni, Genoa Darsena. the show will be presented by.Renata Freccero, professor at the “Universita’ di Torino” and curator of “Italian Olympic Spirit”. This is an important year for the artist. After the success of her ceramic work dedicated to Fencing (and chosen by medalist Valentina Vezzali to release the interviews after the victory) displayed in the Casa Italia CONI (The Queen Elisabeth Convention Center), now it’s time for her personal collection. The key of her pictorial exploration is movement. Movement that animates sails, movement that overtakes airplanes with wind and speed. The sea is seen under many perspectives: from small dinghies to fishing boats, from seaside villages to bustling modern-industrial complexes. From small fishing harbors to industrial shipyards. Not to mention mythology with ceramics of Poseidon and Narcissus. 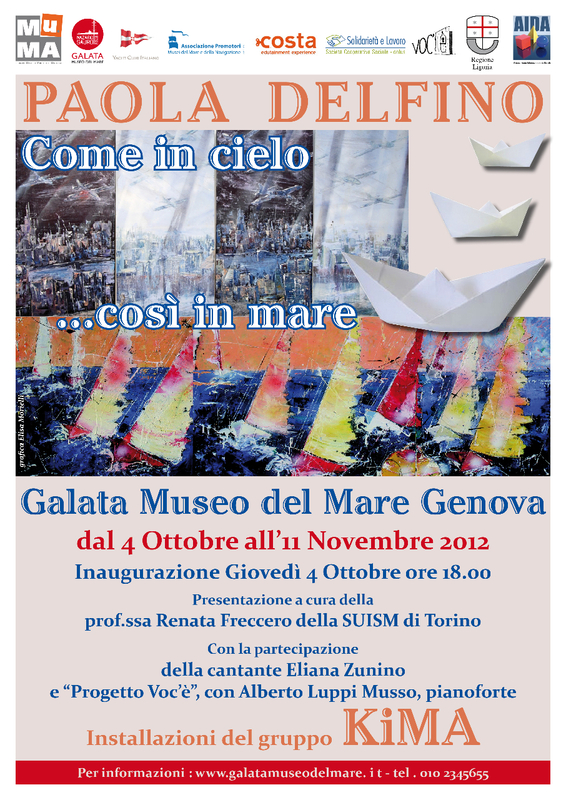 The opening ceremony will be the singer Eliana Zunino , "Project Voc'è" with Alberto Musso Luppi. The show is highlighted by KiMA :Simultaneously from the 1st to 14th of October a different personal exhibition in Savona: “Arte nel Carrello” by CONAD in Via Servetaz. "Sulle Ali del Sound" with subjects inspired by jazz and dance.